Dataedo 6.0 brought unique capability of defining relationships across databases. Both databases need to be imported to the same Dataedo repository. Once you have all required databases and tables in place and want to create new cross-database relationship go to foreign key table. In the Relations tab click Add relation button in the ribbon or in right click context menu. New relation form will open. Choose primary key table database from PK Database dropdown list and the table you want to define relation to in PK Table list. Then define columns and save with OK. 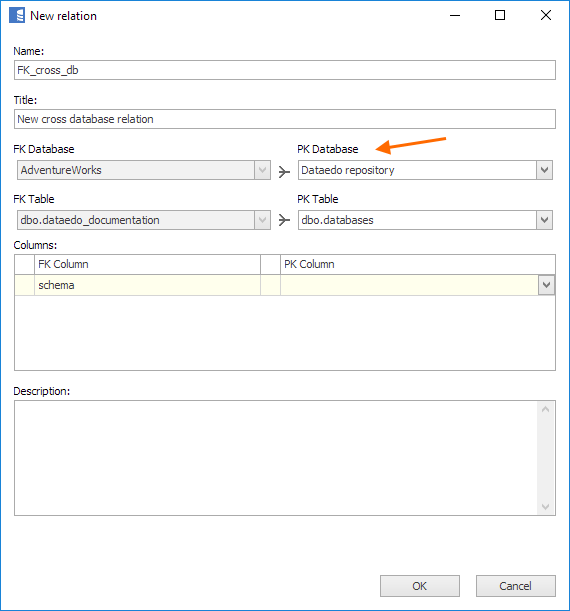 This way you can also create cross database ERDs. When you go to the ERD tab of a module, the the available entities list contains objects from current documentation and objects related to objects currently on ERD from any documentation.